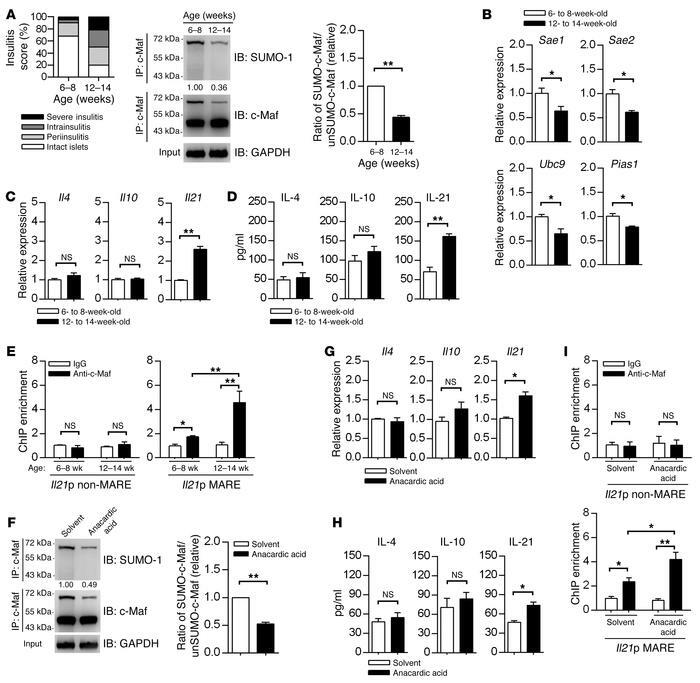 c-Maf SUMOylation in CD4+ T cells is inversely correlated with the severity of insulitis and IL-21 production in NOD mice. (A) The severity of insulitis was classified and scored on 100 islets from 10 NOD mice per group. Immunoprecipitation analysis of c-Maf SUMOylation in 6- to 8-week-old and 12- to 14-week-old NOD CD4+ cells cultured with anti-CD3 and anti-CD28 for 36 hours. (B and C) Expressions of Sae1, Sae2, Ubc9, and Pias1 mRNA (B) or Il4, Il10, and Il21 mRNA (C) in CD4+ cells cultured for 36 hours as described in A. (D) ELISA of indicated cytokines in supernatants of CD4+ T cells cultured as described in A for 48 hours. (E) ChIP analysis of the interaction of c-Maf with the Il21 promoter (Il21p) in CD4+ cells cultured for 36 hours as described in A. (F) Immunoprecipitation analysis of c-Maf SUMOylation in 6- to 8-week-old NOD CD4+ cells cultured for 36 hours with anti-CD3 and anti-CD28 in the presence of anacardic acid (3 μM) or its solvent (DMSO), which were added after 18 hours of culture. (G) Expressions of indicated cytokine mRNA in CD4+ T cells cultured for 36 hours as described in F. (H) ELISA of indicated cytokines in supernatants of CD4+ cells cultured as described in F for 48 hours. (I) ChIP analysis of the interaction of c-Maf with the Il21 promoter in CD4+ cells cultured for 36 hours as described in F. For E and I, isotype-matched IgG was used as a control. See complete unedited blots in the supplemental material. Data represent the mean ± SEM; n = 5 mice (A and F), n = 3 mice (B–E and G–I) per group; 3 independent experiments. *P < 0.05; **P < 0.01; 2-tailed Student’s t test (A–D and F–H) or 1-way ANOVA with Tukey’s post-test (E and I).